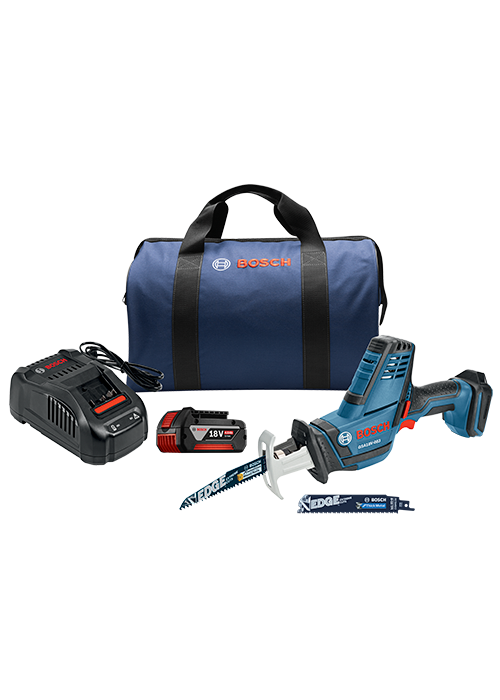 The Bosch GSA18 V-083B11 18 V Compact Reciprocating Saw Kit features a tool built to easily cut through difficult material in spaces that other reciprocating saws can't fit. It has the best power-to-weight ratio in its class, and delivers a fast 3,050 strokes per minute. At only 15-3/4 In. long and 4.4 Lbs. (tool only, not including battery), this powerful cordless recip saw provides an impressive 0.83 In. stroke for an impressive amount of material removal for such a compact saw. The saw is ideal for continuous cutting in over-the-head applications. The easy-to-operate blade-change system allows for fast tool-less blade changes, and its LED light helps to illuminate the cutting zone. This tool comes with a lock-out switch, to prevent inadvertent startup of the tool. The kit includes an 18 V 4.0 Ah FatPack battery (which provides outstanding runtime) and a BC1880 fast charger (which charges a spent 4.0 Ah battery to 80% in 25 minutes).